Sen. Edward Kennedy: "The American people want answers." Leaders from France, Germany and Great Britain gather for a summit to try to settle differences over the U.S.-led Iraq war. WASHINGTON (CNN) -- Under fire from Republicans on Friday, Sen. Edward Kennedy defended his harsh criticism of President Bush's policy on Iraq, in which he charged that the threat from Saddam Hussein was exaggerated by the administration for political purposes. "This is a failed, flawed, bankrupt policy," the Massachusetts Democrat said on CNN's "Judy Woodruff's Inside Politics." "The American people want answers." Kennedy spoke in the wake of an interview with The Associated Press in which he said the threat from Iraq was concocted to suit the administration's political agenda. "There was no imminent threat," Kennedy told the AP. "This was made up in Texas, announced in January to the Republican leadership that war was going to take place and was going to be good politically. This whole thing was a fraud." Kennedy also said Bush is "bribing" world leaders to send troops to Iraq. Republicans have challenged the lawmaker to offer proof of that charge. Kennedy's comments were denounced by leading congressional Republicans, including House Majority Leader Tom DeLay of Texas. 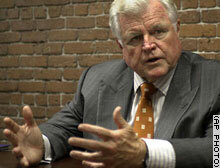 DeLay said Kennedy "went too far" and he called on Democrats to repudiate Kennedy's comments. "It's disturbing that Democrats have spewed more hateful rhetoric at President Bush than they ever did at Saddam Hussein," DeLay said in a written statement. But Kennedy would not back down and said Republicans attack the patriotism of those who question White House policies. "The fact is the American people are asking the questions," Kennedy told CNN. The Senate's leading liberal said the administration needs to better explain how it aims to restore the peace in Iraq and how much the reconstruction effort will cost. Kennedy has been a consistent and persistent critic of the administration's policy toward Iraq. He repeatedly raised questions about the need to go to war before the U.S.-led invasion of that country in March, and he was one of 23 senators who opposed the resolution last year that authorized Bush to go to war. He has since called on Bush to work more closely with other nations in reconstructing Iraq. On Monday, the White House sent Congress its $87 billion budget request for military operations and reconstruction in Iraq and Afghanistan next year. At the State Department, a senior official took issue with Kennedy's comments. "To say they were acting in bad faith is quite a serious charge," the official said. "You can take issue with the policy, but to attack character and integrity is serious and uncalled for." CNN White House correspondent Dana Bash and State Department producer Elise Labott contributed to this report.